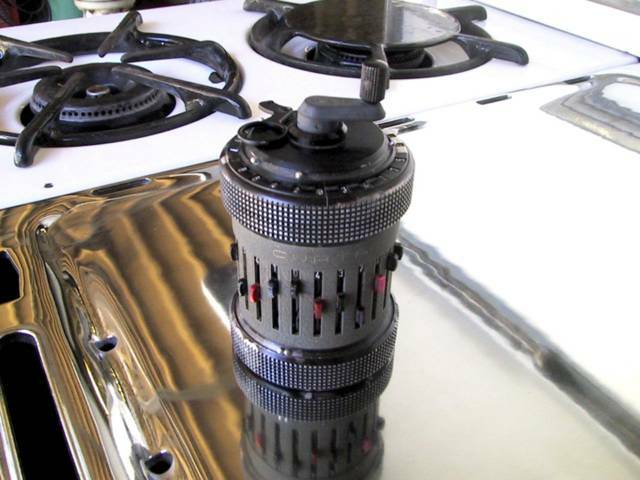 Offered for your consideration, a Curta mechanical calculator Type II (SN#547205) in Fair-Good condition for $400. No case, considerable anodized aluminum wear, some corrision on bottom screws, works perfectly, if a little hesitantly due to needing a tune-up. I inherited a Curta mechanical calculator from my land surveying maternal grandfather and have been calculating cube roots for years. Recently, I came across this Curta that was coincidently manufactured a mere 6 months from the time of my grandfather's Curta. There is really so little that I can add to the already voluminous information available. Suffice to say, the Curta is one of the most amazing mechanical machines ever made. My grandfather's Curta is under a glass dome in my cabinet of wonders. Click the title above for the terrifically informative Curta Calculator website of Rick Furr. Be sure to check out the Flash Curta Calculator emulator. The only thing more amazing is the detailed photo disassembly page - which gave me an upset stomach as disassembling a Curta is a task not for the faint of heart. Standard 10% Chinatown Incubator donation is already included.